The Urabandai Ski Resort area is considered one of the best resorts in Japan because of the quality of the micro-fine snow and the modern ski lifts. Also, women instructors baby-sit small children for the skiers. 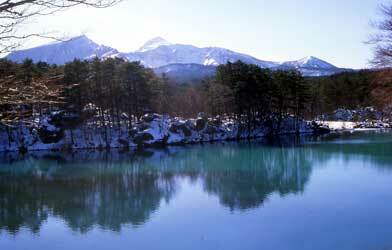 Urabandai provides year-around fishing for sports enthusiasts. 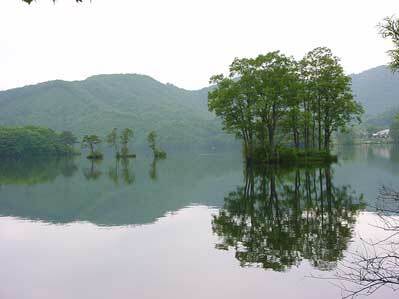 Many lakes and rivers of Urabandai are well-stocked with fishes and idael for fishing. Please observe these regulations and courtesies to preserve the natural environment. Do not make loud noises or talk loudly. Do not pick flowers or collect bugs or animals.Leave everything as you found it. Do not kill anything including plants.Use your senses. Watch! Listen! Taste! Smell! Feel! Do not scare or harass the animals. Do not touch or bother nests, eggs, babies, etc. Carry out your litter and deposit it in designated areas. Groups should not disturb or interfere with other individuals or parties. Do not go into swamp areas or flower gardens. *Please watch for weather changes when climbing the mountains and walking on the trails. *Around the forests of the Urabandai foothills, there presence. *Motor boats are prohibited on Lake Sohara. *Motor boats, ordinany boats, and canoes are prohibited on Oguni-numa and Nakase-numa. 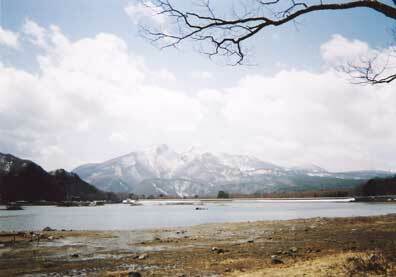 Mount Bandai is called Manyoushu "Aizu-mine" and Treasure Mountain in traditional folk songs. Mount Bandai is also called Aizu Fuji as a symbol of Aizu. A nice trail is provided which is enjoyable even for beginners. From the summit of Mount Bandai, a panoramic view of 360 degrees can be enjoyed. 40 kilometers around Lake Hibara. 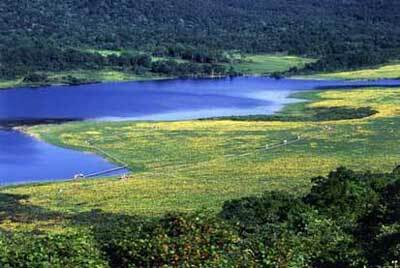 Lake Hibara is the largest lake in Urabandai and was created by damming the Hibara River. 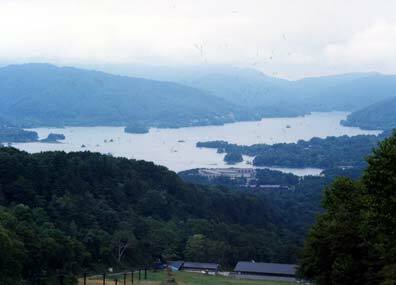 The shoreline of Lake Hibara has a meandering trail of about 40 kilometers. The south side of the shorreline has a ferry port,and the north side has some historical sites of gates associated with Date Masamune. Nakase-numa hiking course a trail around the lake in Urabandai Kougen. Goshiki-numa Nature Trail is the most famous section of this hiking trail.The Goshiki-numa Nature Trail is about 4 kilometers long and passes by mysterious colored lakes. The colors of these lakes are the result of an eruption of Mount Bandai. The vivid colors of cobalt blue and emerald green fascinate hikers. Oguni-numa is surrounded by Nekomagadake. Nekomagadake, which is situated at a low altitude, has a swamp which grows Nikkokisuge (yellow mountain lily), Hioogi ayame, and other mountain swamp flowers and plants. This swamp is designated as a sanctury in order protect these mountain flowers plants. Lake Sohara is the fourth largest lake in Urabandai. There are several pension village around the lake. Special mountain herbs and "Junsai" are harvested in this foothill environment. 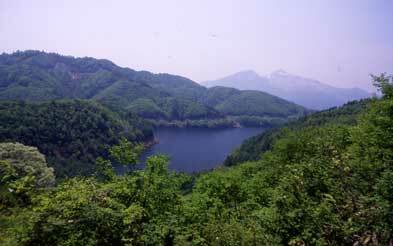 Lake Akimoto is the second largest lake in Urabandai. The reflection of the trees surrounding Lake Akimoto creates a majestic atmosphere. There are nice cycling roads along the lake shore for a delightful cycling adventure. Lakr Onogawa is the third largest lake in Urabandai. There are numerous small islands close to the meandering shoreline of Lake Onogawa. These islands add a special seasonal atmosphere to the area. 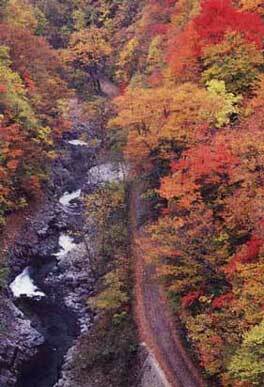 This river gorge contains one of the rivers that flow into Lake Akimoto. The elevation of the gorge falles 1,000 meters over a short distance, which creates numerous beautiful waterfalls and rapids as the river approaches Lake Akimoto. Fudou-taki is located on the upper part of a stream flowing into Lake Onogawa, beyond the village of Onogawa. 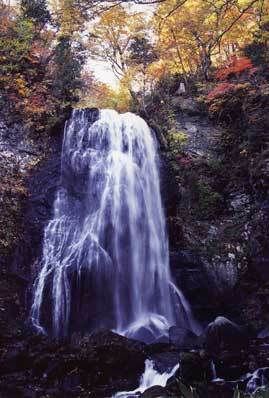 The water from the spring that creates the waterfall is recognized in Japan as one of the "best" drinking waters. Some historical Japanese "Yamabushi" (religious warriors) used this waterfall to increase their stamina and physical endurance. Fudou-taki was known "Yamabushi Shureno-taki" in past history.